During the course of his NHL career, Bates Battaglia made his living going into places that are not for the faint of heart. Whether battling angry Sharks for loose pucks in the corner or jostling giant Panthers in front of the net, every night was a test of courage and a battle of wills. Here he sat, bobbing in the currents of a crocodile-infested river, praying that at any moment the speedboat driver would gun the throttle and catapult him up onto his skis and relative safety on top of the water. To his left sat his younger brother Anthony, equally frightened but comforted by the experience of a lifetime’s worth of water skiing. It was one of those moments when reality television was about to get a little too real. It was time to sink or swim, or in Bates’ case, learn to ski or become 200 pounds of croc bait. Adding to the apprehension was the thought that another team could come flying by at any moment and snag the coveted fast forward pass to the finish line and another fabulous prize that comes with finishing first. “I was more afraid of not doing it and Anthony being mad at me than I was about the crocodiles,” Bates admitted. But fear is a powerful motivator, or at least as powerful as the boat motor that pulled the brothers out of the water and a mile down Botswana's Okavango River, past the warning signs that read, “Crocodiles, do not swim,” until they reached the designated drop-off point. Then they sank back in the water waiting for what seemed like an eternity for the boat to swing back around and pick them up. As scary as that was, it didn’t fully sink in until they were safely back onboard the boat, speeding to their final destination that they saw a six-foot croc sunning itself on the banks. In a trip full of memories this one stood out. What a man won’t do for a million dollars. 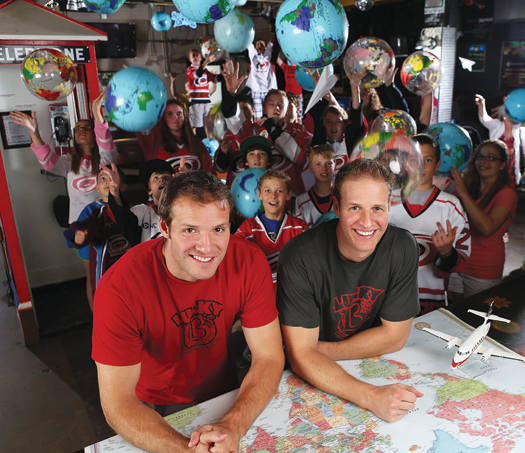 For these two hockey playing brothers from Chicago, the race around the world as part of the hit CBS reality show, “The Amazing Race,” was more than just a dash for cash. It was an opportunity to put themselves and their sport in the primetime spotlight. Starting on Nov. 8 and running for a solid month, they battled 11 other teams as they hopscotched around the globe with stops in French Polynesia, New Zealand, Indonesia, Vietnam, Botswana, Switzerland, Germany, Scotland, Northern Ireland and finally back to the United States. Along the way teams performed various stunts and tasks designed to test their physical skills while others were meant to tax their mental abilities. The brothers knew they would be fine when it came to the physical challenges, but they surprised themselves and the other competitors with their ability to think on the fly. By the time they reached U.S. soil, the field had been whittled down to three teams racing around some of Washington, D.C.’ s most famous landmarks before touching down at Mt. Vernon, home of George Washington. And when the dust settled, the brothers were left standing atop the podium with a million dollars for their efforts. “Being the competitors that we are and having that drive from hockey helped us tremendously,” said Anthony, who added a little hockey humor by taking out his false front teeth, which was a big hit during the initial screen test. It also helped having the familiarity that comes with being brothers, although past series were filled with sibling squabbles that make for some entertaining reality TV. “You watch the show in the past and you see couples who fight about this and that. With Bates and myself we’ll get mad at each other but it won’t last that long. We squash the beef and move on,” Anthony said. That was one of the things the producers liked about the Battaglias when they flew them to Los Angeles for an interview and screen test. Bates had pretty much made up his mind to call it a career after several seasons playing in Europe. Anthony was preparing for another season in the minors when the word came in early November that they would be part of the cast for season 22. Casual viewers of the show over the years, the pair quickly became rabid fans, watching entire seasons to pick up pointers from past winners and losers. Like keeping a journal of countries visited and roadblocks encountered along the way, or forming alliances with other teams. While the brothers tried to be friendly with every team, they struck up a special friendship with Caroline Cutbirth and Jennifer Kuhle, country singers from Nashville. “Honestly, when the show was going on, the question that I got more than ‘did you win?’ was ‘did you guys hook up with the country girls?’ The people wanted to know more about that than how we did in the actual race,” Bates said. If the race looks fast paced in its final edited version it was nothing compared to the day-to-day challenges. In addition to racing from one country to the next, there are roadblocks and other challenges set up along the way. And when the racing is done, teams still have to sit for lengthy interviews that are then boiled down into tiny sound bytes. That left very little time for sleeping and eating. “Your only downtime comes on the flights from one country to another. That was our best time to get a meal or get some sleep,” Bates said. “There is definitely no time for sightseeing. It was awesome going to all these countries and seeing all the stuff we did, but at the same time you miss a ton of stuff because you’re in such a hurry. That also left very little time for trying the local cuisine. Unlike previous seasons, this time there were no crazy roadblocks that required teams to eat giant beetles or frog fallopian tubes, although they were ready for whatever local delicacies that crossed their plate. The brothers agreed that any food would have been welcome at various points along the race. Constantly on the go, Anthony lost about 15 pounds, while Bates dropped enough weight to fit into his brother’s clothes, which came in handy when his backpack was stolen on a local train ride. As challenging as the race was, keeping the results a secret was even more difficult. They returned home shortly before Christmas, and the show did not air until mid-February. 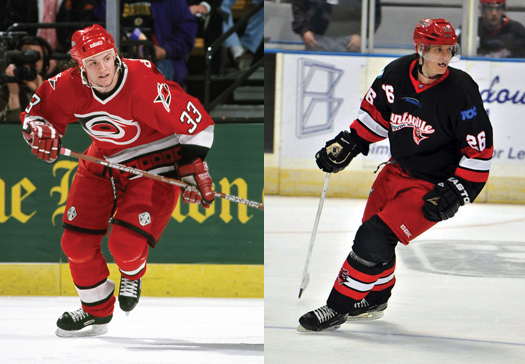 Bates Battaglia was a member of the Carolina Hurricanes team that made it to the 2002 Stanley Cup Finals. Above right, Anthony Battaglia spent 11 seasons in the minors after four years at Western Michigan University. Meanwhile, Anthony went back to playing for the Huntsville Havoc of the Southern Professional Hockey League, while Bates settled into life after hockey, running Lucky B’s bar in the posh Glenwood section of Raleigh. “This is definitely the biggest secret that I’ve ever had to keep. I actually had a good cover. I didn’t get the money until the show was over so I actually had to go back to playing in the minors,” said Anthony, who played four years at Western Michigan University. For Bates, the victory was both a big payday and a small consolation for losing in the 2002 Stanley Cup Finals as a member of the Carolina Hurricanes. It also helped fill a void left by his impending retirement from the game. Even now, several months after the finale aired on May 5, the brothers are still dealing with their fame and newfound wealth. People stop them on the street to ask about the country girls, various obstacles along the way or just want to grab a quick photo and autograph. “I take it all in stride. I’ve never had it like this. Bates has had a little taste of it playing in the NHL. 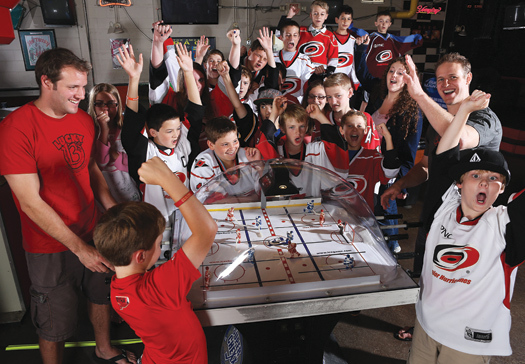 It’s kind of new for me, but I love it,” said Anthony, who hopes to parlay his TV and hockey experiences into a job with the Raleigh Fire Department. As for Bates, he has settled into post retirement life, running his bar and playing for the Lucky B’s adult hockey team. But now bitten by the TV bug, he can envision the day that the brothers will star in their own reality show. Who knows, there may even be a cameo role for a crocodile or two. Bates and Anthony Battaglia celebrate as they are greeted by "Amazing Race" host Phil Keoghan after crossing the finish line at Mt. Vernon, Va.
Leg 12 > United Kingdom > U.S., Washington, D.C.